*** With 68 Titles on the ATP Tour, they hold the record for most doubles wins by a team. *** They have been the #1 Team in the World a record setting six times: 2003, 2005, 2006, 2007, 2009, and 2010. And they were the #2 team in 2004 and 2008, and they are currently the #1 Team. *** Having won the 2003 French Open, the 2005, 2008 & 2010 US Open, the 2006, 2007, 2009, 2010, & 2011 Australian Open, and the 2006 Wimbledon Doubles Championships, they have a Career Grand Slam and they are only the third team in the Open Era to achieve that feat. *** Along with teammates Andy Roddick, James Blake and Captain Patrick McEnroe, they helped bring the Davis Cup back to the United States in 2007. Their doubles match clinched the tie to beat Russia in Portland on Dec. 1 and they were undefeated in their four matches that year. *** They have appeared in 18 Grand Slam Doubles Finals, a new record for the Open Era. *** They are second on the all time Grand Slam Team Doubles Titles with 10, behind the Woodies who have 11. *** They have won the season ending World Tour Finals three times, 2003, 2004, and 2009. *** With a record of 16-2 in Davis Cup Matches playing for the United States, they hold the record for the most wins for a doubles team in Davis Cup history - - - for the US and for any doubles team in the World Group. They have wins over Slovakia, Austria (2 xs), Sweden (2 xs), Belarus, Spain (2 xs), Belgium, Romania, Chile, Russia (2 xs), the Czech Republic, Croatia, and Switzerland. During their eight years on the American DC squad, they have won one title, reached the finals once and the semis twice. *** Named the World Doubles Champions by the ITF in 2003, 2004 2005, 2006, 2007, 2009, and 2010; and it is the first time any team has ever been the ITF World Doubles Champs seven times. *** They have been voted the "ATP Fan Favorite Doubles Team" for the past 6 years in a row - - - every year that they have had the award. *** In December of 2009, the ATP named them the "Doubles Team of the Decade". *** Mike has won 2 Grand Slam Mixed Doubles Titles and Bob has won 7. Mike captured the 2002 US Open and the 2003 French Open with Lisa Raymond. Bob won the 2003 US Open with Katarina Srebotnik, the 2004 US Open with Vera Zvonereva, the 2006 US Open with Martina Navratilova in her last match, the 2008 French Open with Victoria Azarenka, the 2008 Wimbledon with Samantha Stosur, and the 2009 French Open and the 2010 US Open both with Liezel Huber. 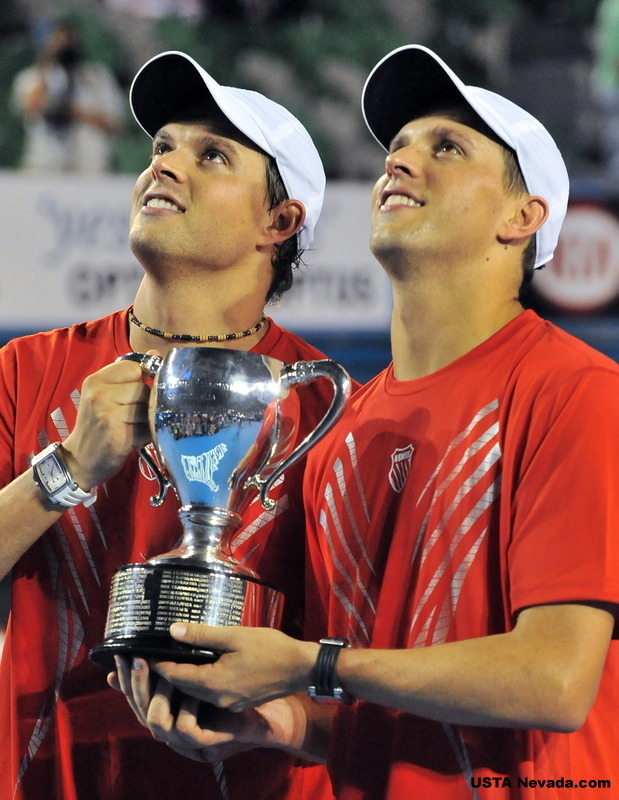 *** The Bryans were the first doubles team in the Open Era to reach seven straight Grand Slam Finals ('05 Australian, French, Wimbledon, US Open, '06 Australian, French, Wimbledon). *** They were only the second doubles team in the past 50 years to reach all the Grand Slam Finals in one calendar year (Paes-Bhupathi in 1999 was the other). *** The twin brothers became the second players since John McEnroe in 1983 to hold the No. 1 ATP Doubles Ranking for an entire calendar year (2006) (Todd Woodbridge also did it twice). *** The were the first set of brothers to ever: finish the year at #1; win a Davis Cup Match for the US; and win an Olympic Doubles Match or a medal for the US. *** They were the first set of brothers since 1924 to win the US Open. *** The hold the record for the most wins by brothers (68) in the Open era. Tom & Tim Gullikson are second with 10; followed by Anand & Vijay Amritraj (8); Gene & Sandy Mayer (5); Luke & Murphy Jensen (4); John & Patrick McEnroe (2). *** They have reached the finals of every Masters Series Event, winning Toronto (3 xs), Cincy (3xs), Madrid (3 xs), Paris (2xs), Miami (2xs), Rome (2xs), Monte Carlo, and Hamburg - - - 17 total. *** They have represented the United States in two Olympics and they reached the quarter finals of Athens in 2004, and they won the Bronze Medal at Beijing in 2008. *** On Dec. 4, 2004, they played in front of the largest crowd in tennis history, 27,200, in Seville, Spain, beating Tommy Robredo-Juan Carlos Ferrero, in the Davis Cup Finals, 6-0, 6-3, 6-2. *** On April 7, 2007, the played before the third largest crowd in US Davis Cup history, 14,453 in Winston-Salem, North Carolina, beating Spain's Feliciano Lopez-Fernando Verdasco, 7-5, 6-3, 3-6, 7-6, to clinch the tie for the USA. *** On February 27, 2010, in winning their semi final night match at Delray Beach, defeating Taylor Dent-Ryan Harrison, they became the first doubles team in tennis history to record 600 wins. They went on to win 601 the next day, and take that title for the second year in a row and capture their 58th doubles championship. *** On Oct. 11, 2010, after winning their 66th title at Beijing, the Bros. had been #1 for 210 weeks. John McEnroe was at the top of the list with 270 weeks at #1, while Todd Woodbridge was 4th with 205 weeks. *** On November 6th in Basel, Switzerland, in beating Yen-Hsun Lu-Janko Tipsarevic, 6-1, 6-2, the Bros. clinched #1 for 2010 and they set the record for being #1 for the 6th time. They had previously been tied with the Woodies with 5. The next day the won Basel for the 4th time and beat Daniel Nestor-Nenad Zimonjic for the 3rd straight time, 6-3, 3-6, 10-7. It was Mike 'n Bob's 11th title of the year and they had not lost a final in 12 straight, dating back to November of 2009 - - - and that had not been done in 30 years. *** During the 2010 season they became the first team to appear in 11 finals and win each one. They were a perfect 11-0 for finals that year. Technifibre, Tournagrip, Crowne Plaza Hotel, the American Pork Assn, and Ace. *** They were both two time All Americans at Stanford and won the NCAA Team Championship their two years there before turning pro. 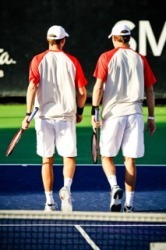 In their second year, Bob won the NCAA Singles and Mike & Bob won the NCAA Doubles. Bob was named the College Player of the Year in 1998. *** Bob was #1 in the Boys 18s in 1996 and was named the Junior Player of the Year. *** The Bryan Brothers were #1 in the US in doubles in the juniors in the 12s, 14s, and twice in the 18s. 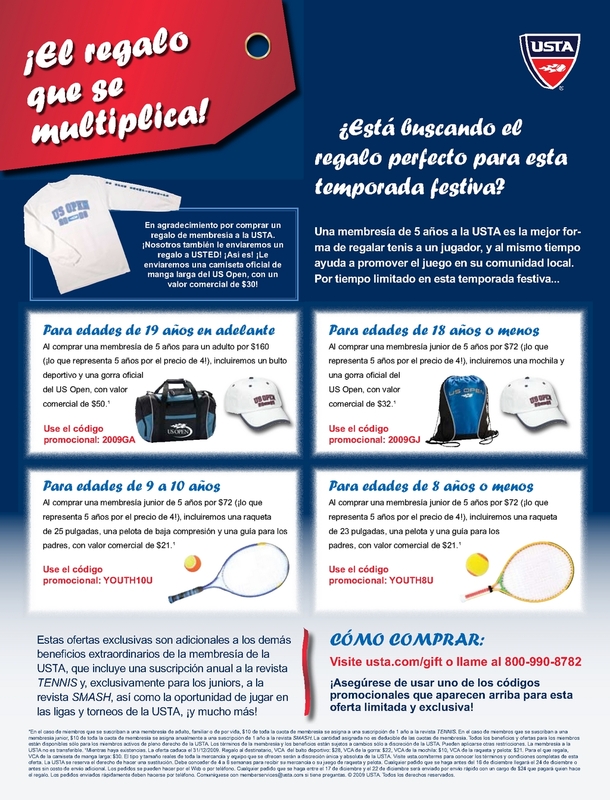 *** They are the National Spokesmen for USTA Junior Team Tennis. *** They do charity work and events for their own Bryan Brothers Foundation, and also make donations and do exhibitions and appearances for the Elton John Aids Foundation, the Tim & Tom Gullikson Foundation, the Andre Agassi Foundation, the Andy Roddick Foundation, the James Blake Foundation, the Mardy Fish Foundation, the Pam Shriver Foundation, the Justin Gimelstob Foundation, the Eric Butorac Foundation, WECANN supporting Abused Children, the Cystic Fibrosis Foundation, Bogart Pediatric Cancer Research Program, the Tourettes Syndrome Foundaiton, Oncology Unit at the Ventura County Medical Center, Variety - - - the Childrens Charity of the Desert, Tennis Success Program of Corpus Christi, Keys to Tennis Success Program in San Jose and Sacramento, Maggie Moon Memorial Scholarship Fund, the Pete Brown Scholarship Fund, Ryan O'Neil Memorial Fund, Youth Mentoring Connection, Pakistani Flood Relief - - - Aisam Qureshi Foundation, the Red Cross, Make a Wish Foundation, Camarillo Boys and Girls Club, Oxnard Boys and Girls Club, Smiley High School Tennis Teams, North Forest High School Tennis Teams, Rio Mesa High School Tennis Teams, the VCJTA, the SBJTA, the SoCal Jr. Tennis Assn., EPATT, the Stanford Tennis Teams, the UCSB Tennis Teams, and Cal Poly Tennis Teams. *** And they also make several appearances across the country and around the world for charity and special tennis events with their musical group, the Bryan Bros. Band, and they have a new CD out called Let It Rip. *** In October of 2008 they sat in on keyboard and guitar with the popular rock group, Counting Crows, in a huge concert in Tampa. 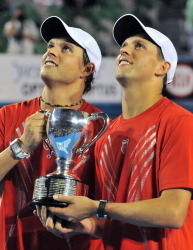 *** On Aug. 29, 2010, their Bryan Bros. Band performed two songs - - - Let It Rip and Autograph with Novak Djokovic - - - before over 20,000 at Arthur Ashe Stadium and a national television audience on CBS. *** They have thrown out the first pitch at Yankee Stadium twice and at Dodger Stadium three times. *** On August 1, 2010, at UCLA at the Farmers Classic, on a center court that they had played on so many times as juniors and in college and where they got their start in pro tennis, the Bros. became the winning doubles team of all time, capturing their 62nd title. The stadium was packed and the crowd was going crazy as they battled back after dropping the first set to the hot serving Eric Butorac-Jean Julien Rojer, and then they went up 5-0 in the third set TB, only to see it even up at 7-7. With their friends, family and fans roaring on each shot they won the last three in a row and with Bob blasting a serve to the deuce court, Mike smacked away a forehand volley down the middle and then Mike jumped into Bob's arm and they had done it. The ceremony was super sweet and Mark Woodforde was there and said very kind and gracious words as did Mike and Bob about the Woodies - - - whose record they had just broken. Their parents Wayne and Kathy were down on the court with them. *** On August 3, 2010, while doing a junior clinic on the South Lawn of the White House, Presdient Obama suddenly appeared on the scene and greeted Mike and Bob with "Here's those Bryan Brothers. I read about you guys in Sports Illustrated." They had a warm and fun conversation for two minutes before the President walked back with his advisors and security guards to the Oval Office. *** Received the USTA President's Award from Jane Brown Grimes at a luncheon in Naples, Florida, on April 14, 2008: "For outstanding and unfailing commitment to U.S. tennis - - - doubles champions of singular character." *** They were named to People Magazine's November 17th, 2006, "Sexiest Man Alive" Issue. *** On Feb. 17, 2006, after a whirlwind media junket in the Big Apple, they rang the closing bell at the New York Stock Exchange. *** On March 21 of 2010 they were featured on 60 Minutes with Lesley Stahl. And on April 16-18 they were featured on CNN International. They had a big article in Sports Illustrated the week of April 19, 2010. They were featured on Greta Van Susteren's On the Record on Sept. 1, 2010. In January and February, the were one of the only tennis players ever to have an ESPN commercial.